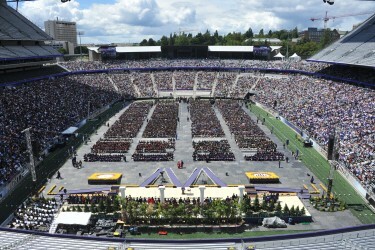 The Office of Ceremonies produces what one former University president referred to as “the two most consequential ceremonies of a student’s academic life”: the New Student Convocation and the University of Washington Commencement. Convocation and Commencement are the only ceremonies at which the entire University—its faculty, staff, administration, and all 16 schools and colleges—unites to celebrate its fundamental purpose: to provide students with a transformative educational experience and instill in them a passion for learning. These ceremonies also showcase the University’s excellence, its vision and reach, to the entire world. At convocation new students are welcomed into the University community and begin to get a sense of the voyage of discovery that awaits them. 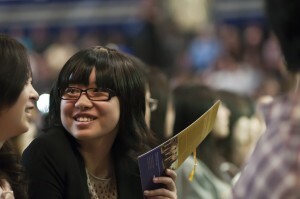 At Commencement we share their achievements, as well as those of our outstanding faculty and alumni, with 35,000 guests at Husky Stadium and, via the web, a national and international audience. The events produced by the Office of Ceremonies are among the largest and most important public events held by the University. They are the vehicles through which we share our mission with the larger community and nuture a shared commitment to the University’s winning traditions. These ceremonies offer proof that dreams can come true, that a better world awaits us, and that the future burns bright with promise.